The Digital Champion awards highlight digital businessess who are changing their markets; and creating new markets through the application of digital technology. Digital technology will underpin Britain’s economic recovery, enabling UK businesses to unlock new markets, raise productivity and improve operating practices. 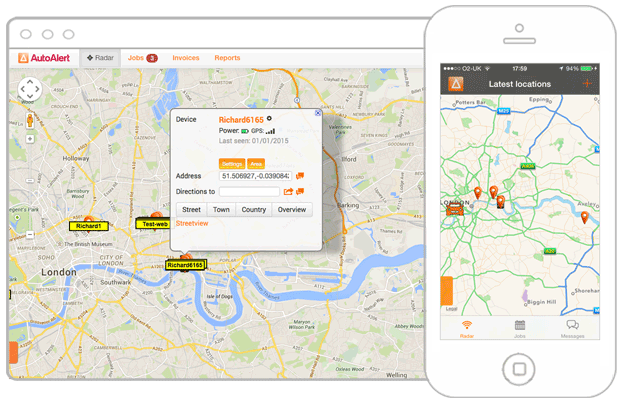 AutoAlert’s digital approach to job management is creating a disruptive influence to all those industries which use remote workers including electrician and plumbers, security companies, transport and logistics and facilities managers. AutoAlert’s mission is to eradicate paper based job sheets. Millions of jobs sheets are created each day to provide job details to remote workers such as electricians and plumbers and to get information back about the work they’ve done on each job. Unfortunately the process is labour intensive, involves lots of duplication, especially as more subcontractors are involved in the job and is opaque with no one knowing what is happening with each job until the job sheet is returned – often weeks later. AutoAlert’s solution is a “social network for blue collar workers” which allows companies to connect to each other, send and receive jobs, then monitor and share the status of their jobs as they’re updated in the field by the engineer on their mobile phone. AutoAlert provides clarity over what is happening as it happens, this leads to less anxiety, less chasing employees and more time for other tasks. We are small in size but big in ambition. We have almost 20,000 customers using our platform but believe we can get millions due to the massive value our customers derive in connecting to their own customers and suppliers and being able to share the status of their jobs. Paper based job sheets are wasteful and inefficient. No one knows what is happening with a job until the job sheet is returned. By automating the process and by allowing engineers to update the job sheet on their mobile phone when they’re doing the job rather than filling out job sheets at the end of the day, or week this means everyone is aware what is happening as it happens. This means no waiting around for job sheets, no difficult to read or missing information and no chasing remote workers by telephone. Job details can be updated in the office or on site. The information is immediately available to all concerned ensuring customers, suppliers and engineers can respond immediately to any changes. As the list of jobs is available on your mobile telephone, you can see any new jobs that have arrived and add them into your working day rather than having to come back to the office to pick up additional jobs. If a job is not viewed, or if there is any delay, then alerts are generated to all concerned so any issues can be resolved or the job reallocated to another engineer. Mobile telephones and the mobile web are an integral part of our “blue collar social network”. In the past, remote workers got information about their jobs on a piece of paper. A form was then completed once the job was done and taken back to the office often the next day or even a week or so later. Handwritten information is often difficult to read and information may be missing. If the job sheets are returned days or even weeks later then this can lead to additional problems and disputes when raising invoices. Unfortunately, by this time the information is no longer fresh in everyones mind. By using a mobile telephone to update the job details, the engineer gets the information in real time with text or push notifications when a new job has arrived. They can update the job while they are on site and while the information is still fresh in their minds meaning less errors, less chasing and quicker and more accurate invoicing. Other companies are now using mobile telephones to provide a more simple, real time way of updating job sheets. They work well for individual companies but fall down when more than one company is involved in the job. With AutoAlert, we’ve learnt from leading social networking companies such as Dropbox, Twitter and Facebook and have developed a connected system that works right the way along the supply chain, no matter how many companies are involved in each job. We continue to learn and innovate, we speak to our customers regularly and spend time with them to understand how they are using our platform, how we can make it easier to use and how we can improve their lives. We also get thoughts and inspiration from other successful companies whether they’re working in related fields or in completely separate areas. In terms of entrepreneurialiasm, i believe one key trait stands out – determination. We’ve faced many ups and downs, we’ve changed and improved our strategy and have now got to a stage where we have almost 20,000 customers using our platform with ambitions for millions more. We have been working with a number of key customers since 2009. They were using our GPS tracking technology to help manage their vehicles and engineers. However, they wanted to expand, they were getting interest from large national companies but were concerned that they wouldn’t have the time and resources to manage the subcontractors that would be required to take on these new contracts. Consequently we worked together to develop our job management software in order that they could better manage their jobs and workers. We now have over 18,000 customers using our system. We have processed over 4,000 jobs with a value of approximately £1 million. We have eradicated about 5,000 paper based job sheets and 15,000 telephone calls. We have also allowed our customers to expand and take on more business. We estimate our customers have saved about £160,000 in costs by being able to reduce duplication, paperwork and calls to field workers to find out where they are. At AutoAlert we’re keenly aware of the need for innovation. Both to set us apart from the competition and also to improve our own customerss working lives. We want to be special and we want to give our customers the tools so that they can be special too. We have won a number of awards including Best Aftermarket product for the Telematics Industry – where we were competing with large multinationals including GM Motors. Find out more about how AutoAlert job management software can benefit your business.